Acquired: Acquired June 11, 2018 in a trade with Hamilton Tiger-Cats in exchange for an eighth-round pick in the 2019 CFL Draft. 2018: Played in eight games for Toronto, started all eight. Missed season opener due to injury, played next six games before being placed on six-game injured list. Returned to play in two of the Argos final three games of the season. Recorded one sack and one interception along with 25 tackles. 2017: Signed as a free agent by Hamilton on February 14. Played seven games, started all seven. Recorded 17 tackles, two sacks, one forced fumble and a pass knockdown. 2016: Played 16 games, started all 16. Had 52 tackles for Ottawa Redblacks, with three interceptions and a sack. Named CFL East All-Star for the second time. Playoffs: Started in East Final win over Edmonton. Had six tackles and a pass breakup. 104th Grey Cup: Recorded three tackles, a tackle for a loss and a sack in win over Calgary. 2015: Played 17 games, started all 17. Recorded 57 tackles, six interceptions, two sacks, forced four fumbles, recovered three fumbles. Had a seven-tackle game against the Argos on September 26. 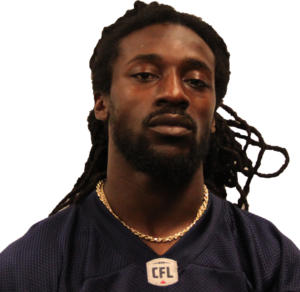 Tied for the CFL lead in interceptions. Named East Division and CFL All-Star, each for the first time. Playoffs: Started East Final. Had one tackle in win over Hamilton. 103rd Grey Cup: Started and had five tackles in loss to Edmonton. 2014: Assigned to Orlando Predators of Arena Football League…Signed with Ottawa on April 29. Started 10 games for the Redblacks, recording 29 tackles, three knockdowns and three interceptions. Made CFL debut August 29 at Montreal. 2013: Signed as an undrafted free agent with Cleveland Browns May 13. College: Played two seasons at New Mexico Highlands University. Had 107 tackles, five blocked kicks and nine interceptions, four of which he returned for touchdowns. Also returned two kickoffs for TDs. Was an All-American as a senior and played in the NFL Players Association Collegiate Bowl Game. Personal: Born in London, England. Attended Potomac High School in Dumfries, Virginia.